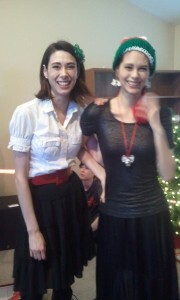 Most of us went to a Christmas service this morning. Joanna stayed home because she was feeling tired and nauseated. (Now that she has a job at Tim’s office, she’s been catching the bus at 7:00 AM.) We had three types of lasagna for lunch–meat, vegetarian, and vegan. 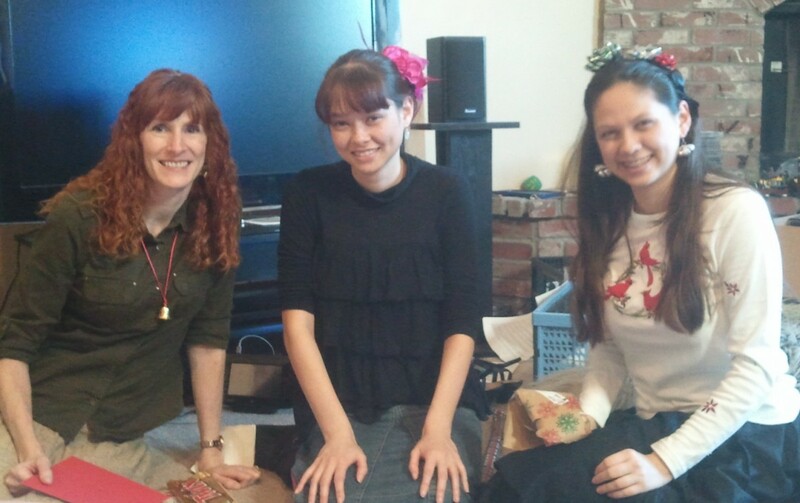 So finally around 2 PM, we got around to taking our Christmas pictures and opening presents. Because our Lumix camera is in need of replacement, Tim took a number of pictures using his cell phone. Thus the quality is much reduced. 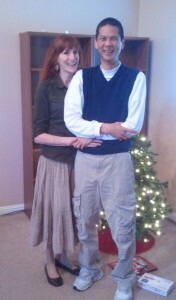 Fortunately Justin took a few of our “official” Christmas photos. Here’s the whole family. 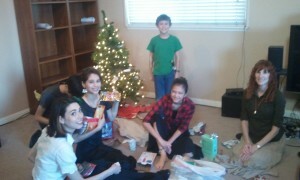 Front (L to R): Josiah, Joanna, Nicole, Victoria. Back: Jason, Jeffrey, Tim, Jeri, Sarah, Elizabeth (behind), Justin. Click photo for full size. Because we hope to move into a new house in a week or so (we’re currently in escrow), we didn’t put up our Christmas tree and decorations. 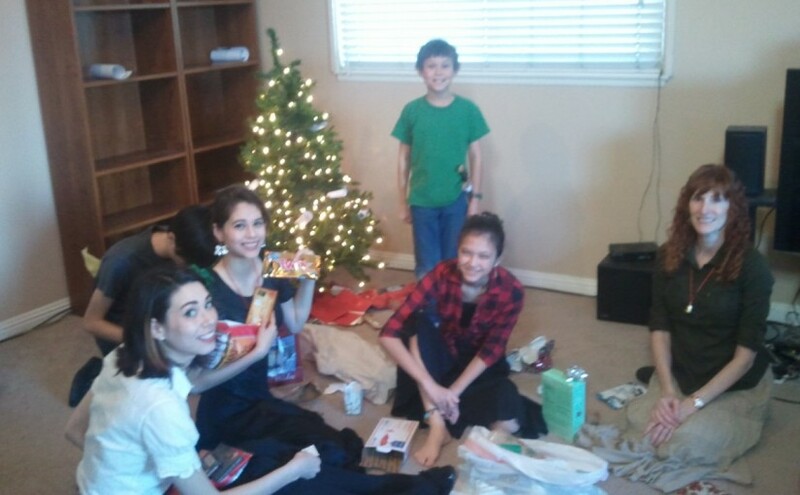 Instead, we only put up our little tree without any decorations. The number of presents was much reduced this year. 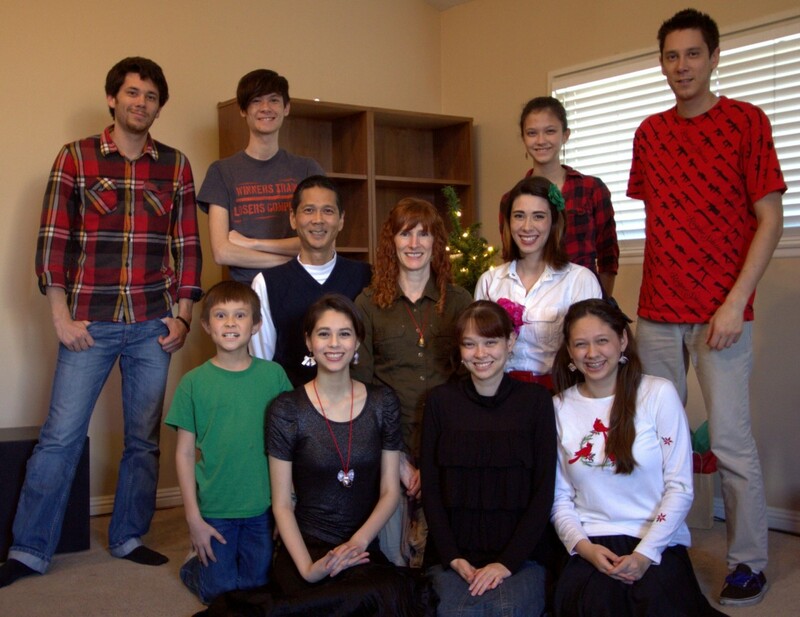 Tim and Jeri didn’t have the time (or funds) to buy stocking stuffers and little gifts of the kids. Earlier this fall (prior to house hunting), they bought a Disneyland pass for everyone. (Grandma Pau’s Christmas money went to cover part of this expense.) In other words, Tim and Jeri got everyone one BIG present instead of various smaller items. 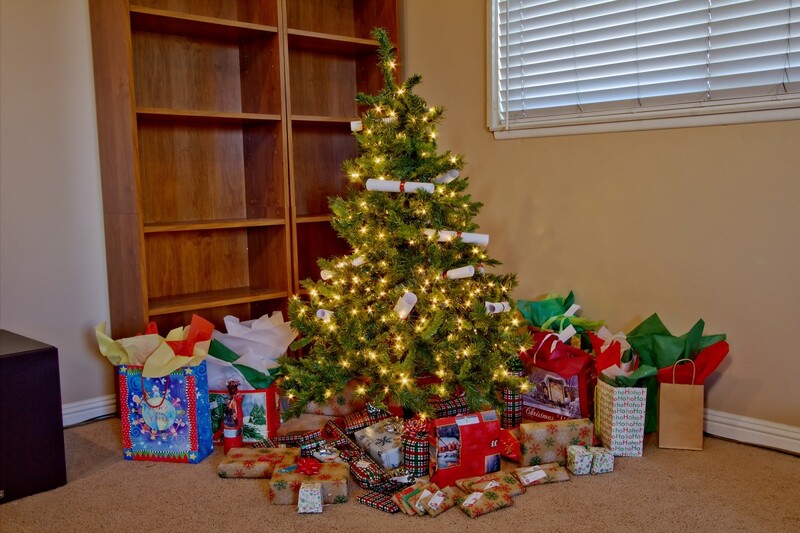 Christmas Tree with Presents. Click photo for full size. Here are Sarah, Joanna, Josiah (in back), Elizabeth (aka Lizzie), and Jeri. Sarah, Joanna, Josiah (back), Elizabeth, and Jeri. Click photo for full size. Here’s Josiah with a Christmas stocking made by Lizzie. 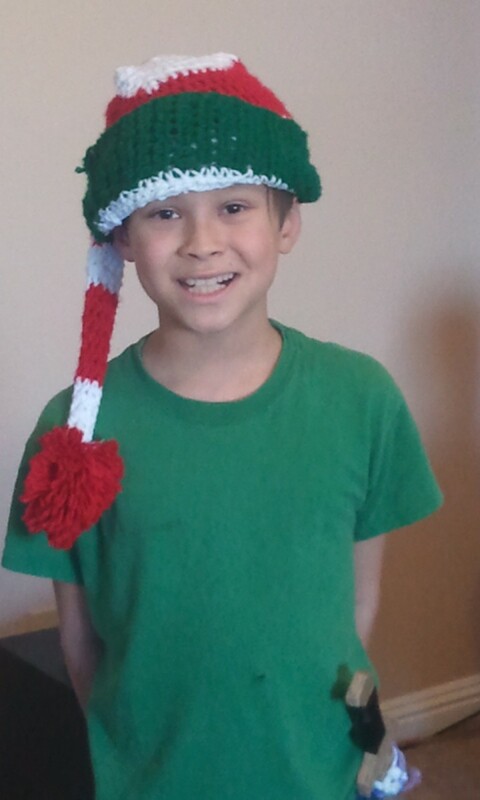 Josiah with a Christmas Stocking. Click photo for full size. 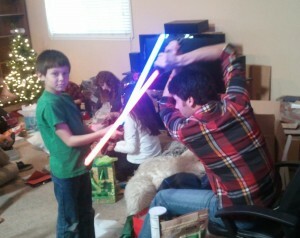 Josiah and Jason in a Star Wars battle. Click for full size. Here are the four boys. From left to right, Jason, Josiah, Jeffrey, and Justin. 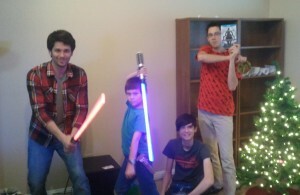 The boys along with two light sabers. Click photo for full size. 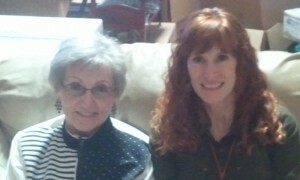 Grandma Stogdill and Jeri. Click photo for full size. Sarah and Joanna. Click photo for full size. Jeri, Nicole, and Victoria. Click photo for full size. Jeri and Tim. Click photo for full size. Later in the afternoon, most of us watched another version of the movie “Scrooge.” This time it was the 1970 musical version featuring Albert Finney. On Christmas eve, we stayed up late and watched “It’s a Wonderful Life” with James Stewart and Donna Reed.